The death of Philip Bradford was listed in the the Farnhamian dated August 1917. Philip Bradford was born in 1894 and lived on the Waverley Estate. He attended West Street School before entering Farnham Grammar School. His father, Curtis Bradford, ran the corner shop in Alfred Road and the Waverley sub-Post Office. Philip Bradford was a well-known member of the school football eleven. After school he helped his father in the grocery and provision business. Early in the war he joined the Hants Carabiners and later transferred to the Queen’s Royal West Surrey Regiment. He was posted to France just before Christmas 1916. He was killed on 16 January 1917. It is believed he was shot during his first spell in the trenches. Private Philip Bradford was serving with the 11th Battalion, the Queen’s Royal West Surrey Regiment. He was killed on 16 January 2017, aged 22. His is buried in grave L-32 in the Dickebusch New Military Cemetery, and his name is commemorated on the School’s War Memorial. Philip Bradford was the son of Curtis and E. Bradford, of Alfred Road, Farnham, Surrey. The death of John (Jack) Day was listed in the the Farnhamian dated August 1917. Private John Clement Day was serving with the 23rd Battalion, Royal Fusiliers, and as killed on 28 January 1917, aged 20. He is buried in grave 1-D-15 at Courcelette British Cemetery, and his name is commemorated on the School’s War Memorial. John Clement Day was the son of Clement and Florence Day, of “Withdene”, Gordon Road, Camberley, Surrey. The death of Arthur Hopcraft was listed in the the Farnhamian dated August 1917. “Arthur Hopcraft, The Buffs, killed in action at Kut”. There appears to be a discrepancy between the school’s record of his name (Hopcraft, as recorded also on the School’s War Memorial) and the Commonwealth War Graves Commission (which records his name as Hopcroft). Arthur Hopcraft was born in Alton and lived with his aunt and uncle at 36, Long Garden Walk, Farnham. He attended West Street School and then moved to Farnham Grammar School. He enrolled in Ashford and joined the 1st/5th Battalion, The Buffs. His regiment sailed for India and fought in Mesopotamia. The town of Sannalyut was attacked and captured in February 1917. It seems likely that Arthur Hopcraft was killed during this action. Lance Corporal Arthur Hopcraft was serving with the 1st/5th Battalion, The Buffs (Royal East Kent Regiment) and was killed in action on 15 February 1917. He is buried in grave XXI-M-10 at Amara War Cemetery, and is commemorated on the School’s War Memorial. The death of Sidney John Elliot Spencer was was listed in the the Farnhamian dated August 1917. Sidney John Elliot Spencer was previously wounded in France, and recovered from his wounds in a hospital in Brighton. His parents were well known for running a drapers shop at 51 The Borough, Farnham. After recovering from his wounds Sidney Spencer wanted to return quickly to the front and catch up with his friends. Unfortunately he found that most of them had been killed or wounded. Sidney was later killed fighting on the Somme on 28 February 1917. Private Sidney John Elliot Spencer was serving with the 2nd Battalion, Royal Fusiliers, and was killed on 28 February 1917, aged 23. He is commemorated on Pier and Face 8 C 9A and 16A of the Thiepval Memorial, and is commemorated on the School’s War Memorial. 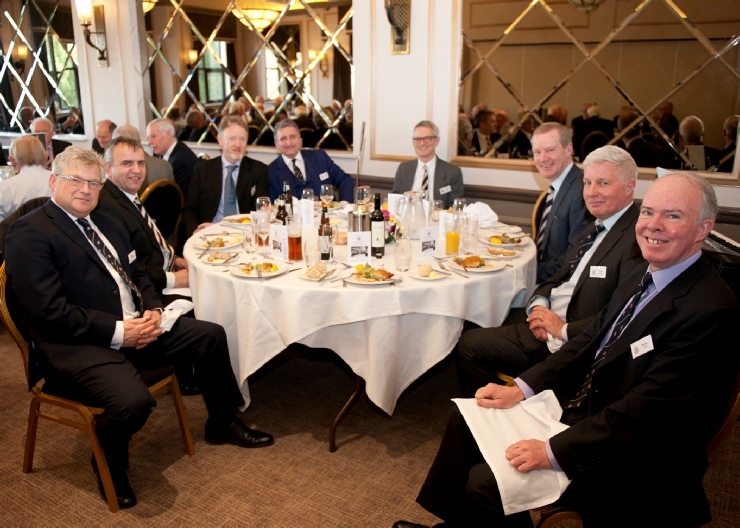 The 85th Annual Gathering of the OFA took place on Saturday 25 March at the Surya Farnham Hog’s Back Hotel. There was an excellent turnout of “old boys” for the event. Brian Williams said grace after which all stood in respect, as the names of Old Boys who had died in the past year were read out. The guest speaker was Sally Francis, Principal at Farnham Sixth Form College from 1997 until 2007. 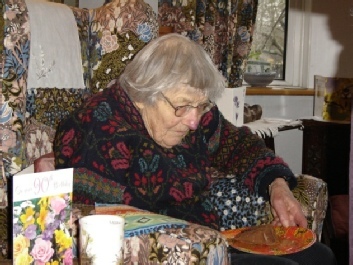 She recalled her dealings with the Old Boys and appreciated being a life honorary member of the Association. Her speech was typical of this well liked Principal and contained some humorous recollections. Gordon Andrews proposed the Toast to the Association and told the guests that in his youth he was a sickly child and frequently spent time ill in bed. To keep his mind active he began to explore mental arithmetic and in time could work out difficult mathematical sums in his head. Returning to school he amazed the teachers with this new found skill and gave an example to the guests of this. It was an interesting and very original toast. Ted Mayne made the Toast to the Association and explained that after leaving school he worked for a while in France and improved his ability in the language. On returning home he applied, and surprisingly obtained, a position with the diplomatic corps. This resulted in many years travelling across the globe and he thanked the old school for giving him an excellent basic education. Roger Edgell replied to both toasts with his dry wit and explained that the Old Boys were increasingly involved in supporting projects at the Sixth Form College. He welcomed former Principal Mike Potter to the dinner and said he would always be welcome. The current Director of Farnham SFC, Dr Jason Jones, was unable to attend. Derek Bowtell made the Roll Call and guests stood as he called out the years covering their years at school. John Crotty was first to stand for the year 1941 and John Clarke and Julian Walden were left standing with the last year of grammar school pupils in 1978. We look forward to another enjoyable lunch in 2018. 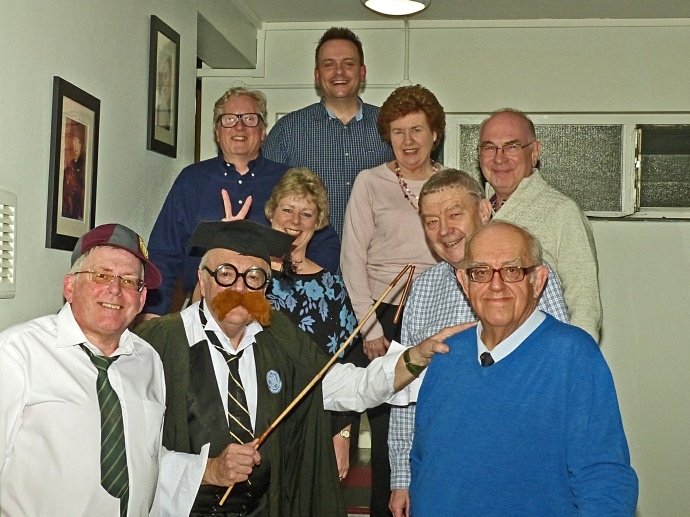 Guests attending the Old Farnhamians and Farnham Sixth Form College show entitled “Jazz and Comedy at the College” received quite shock as they entered the reception area and were faced with show band leader, Geoff Hiscott dressed as a Headmaster in gown, mortar board and wielding a cane. They were urged to take their seats or get “six of the best” and were escorted to the Performance Hall at Morley Road by current students dressed in St. Trinians garb. This set the tone for a first class evening of entertainment. This was a special evening for the college, the Old Boys and the 150 plus audience. It is hoped that £1000 was the result and these proceeds will go to the college to purchase computer equipment. A full report of the evening’s entertainment can be downloaded here. Dr. Jason Jones (Director of Farnham Sixth Form College) thanked the organiser, the performers and the helpers and wished everyone a safe journey home. This was a new experience for the college and a possible repeat will be considered for 2018. You have been warned! Front row: Nick Ridley, Headmaster Geoff Hiscott, Cyril Trust (Organiser); Second Row: Sue Lampard (Quintessential), Roger Edgell (President of the Old Boys), Back Row: Richard Phillips (Old Boys Vice-President), Jason Jones (Director of Farnham Sixth Form College), Wendy Craig (Chief Executive for Tindle Newspapers), Brian Wiliams (Secretary for Old Boys). We regret to report the passing of Miss Blair on 29 November last. She was aged 94. A short obituary has been added here, and further details can be read in the final FGGS OGA newsletter. A number of us were able to attend the Saturday lunchtime session at the Maltings Beerex. This year we were delighted to be joined by Andy Vincent! 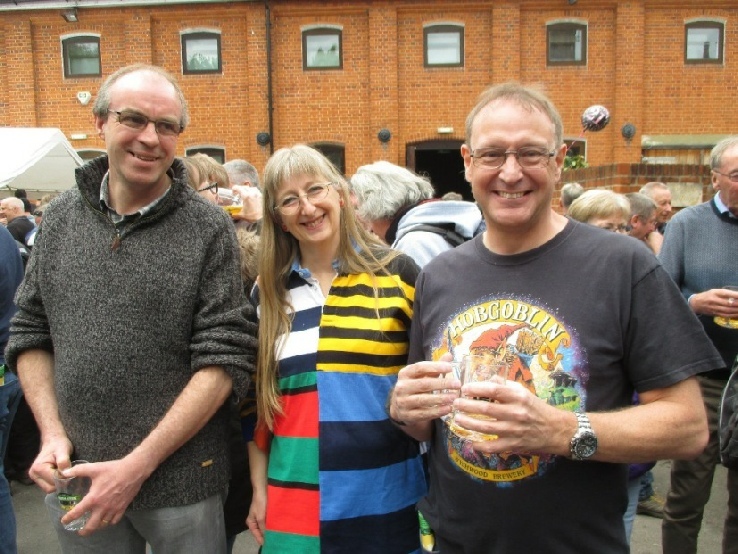 The Beer Festival as closely followed by David Bathurst’s Hymnathon. This unusual event was held at St. George’s Church, Eastergate, Sussex. 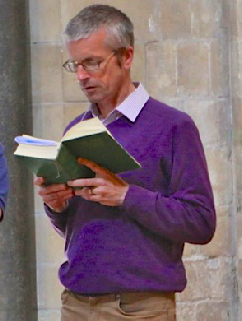 David tells us that, “Between 29 April and 1 May inclusive I will endeavour to sing, from memory(with organ accompaniment), all 400 hymns in the BBC Songs Of Praise hymnbook. Unlike my Bible reading I will stop for sleeps! The timings are 9.30-5.30 (Saturday & Monday) and Noon-5.30 Sunday. Monies raised will be donated to the Friends of Sussex Hospices. During the afternoon of 30 April, David sang “Dear Lord and Father of Mankind” dedicated to FGS, FGGS and FC, former students and staff. 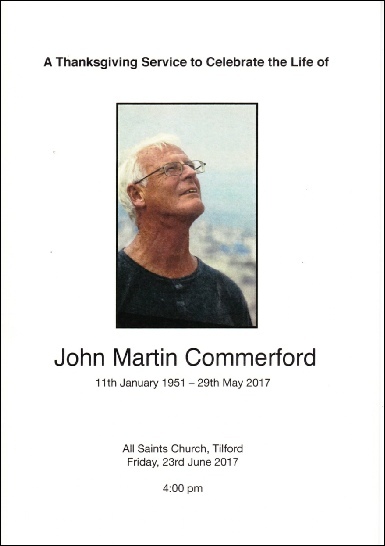 A Thanksgiving Service to celebrate the life of John Commerford took place in All Saints’ Church, Tilford, on the afternoon of Friday 23 June. It was followed by the interment of John’s ashes in the churchyard. Afterwards, a party to further celebrate his life took place in the Tilford Institute. As previously reported on our Facebook page, John passed away on 29 May. For many years he taught Physics at the Grammar School and Farnham College. A full obituary has been posted here. Many former staff and pupils attended both the Thanksgiving Service and the party. We include a photo of John, Andy Sayer and Mike. The social event of the year was keenly anticipated. 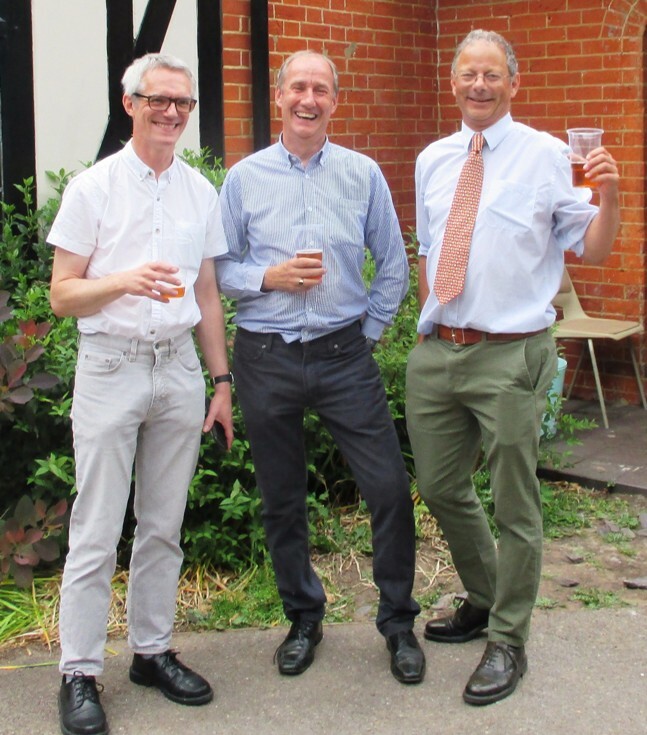 The classes of '71 and '72 (the last cohorts from the former Grammar Schools) met in the relaxed surroundings of Tilford’s Duke of Cambridge PH. The weather was favourable and there was a steady flow of beer and banter, followed by lunches and a further run on the ales and Hazy Hog Cider. Former pupils had travelled from near and far; from as far away as Australia (thank you, Bridget! ), from Thailand (Phil Hambly), from Scotland (Arnie Arnstein) and from the depths of the West Country (Ian and Gill Richards). The careers of those attending ranged from ship master to barrister. The medical profession was particularly well represented. Everyone was reassured to learn that in the event of any medical emergency developing during the course of the afternoon, they could rely on the presence of no fewer than three GPs, a consultant surgeon and a consultant anaesthetist! The sun’s appearance brought out the summer dresses (on the girls, not the boys! - Ed), an assortment of hats (a splendid one was worn by Arnie), cravats, shorts (Mike) and in one case, shoes worn without socks (Chris!). thanking everyone for being there and saying what wonderful friends we all were (hear, hear!). Arnie was presented with his birthday card and as people slowly drifted away, thoughts turned to the possibility of staging a further social event a few years hence, marking our collective 60th birthdays. Below, we present a photographic gallery of the reunion. The death of Frank Laurence Fulton was was listed in the the Farnhamian dated April 1919. Frank Laurence Fulton was killed by a shell near Dorian, Macedonia, on 20 March 1917. According to The Farnhamian, “He volunteered at the very beginning of the war, as one would have expected of him, and was only 19½ at the time of this death. His contemporaries at the school will be deeply grieved to hear of his death.” The Commonwealth War Graves Commission records that Frank Fulton volunteered for Foreign Service in August 1914, and he served in France and Greece. Frank Laurence Fulton was the son of George E. Fulton and Isabella Lansdown Fulton of 4 Victoria Villas, Brookwood, Surrey. Corporal Frank Laurence Fulton was serving with the 2nd/16th Battalion, London Regiment (Queen’s Westminster Rifles), and was killed on 20 March 1917, aged 19. He is buried in grave F-1216 in Karasouli Military Cemetery, Greece, and is commemorated on the School’s War Memorial. The death of Alfred Greenwood was was listed in the Farnhamian dated August 1917. Alfred Greenwood was the son of Ernest and Marie Greenwood of 9 Testland Road, Guildford, Surrey. Rifleman Alfred Greenwood was serving with the 11th Battalion, London Regiment (Finsbury Rifles), and was killed on 19 April 1917, aged 21. He is buried in grave XIV-E-11 in the Gaza War Cemetery, Israel/Palestine, and is commemorated on the School’s War Memorial. The death of Gordon Mason was was listed in the Farnhamian dated August 1917. Gordon Mason was the son of Fannie Elizabeth Mason of 13 East Street, Farnham, and of the late Robert Dykes Mason. Second Lieutenant Gordon Mason was serving with the 21st Battalion, King’s Royal Rifle Corps, and was killed on 7 June 1917, aged 20. He is buried in grave III-C-20 in the Dickesbusch New Military Cemetery Extension, Belgium, and is commemorated on the School’s War Memorial. The death of Thomas Hollingsworth Tovey does not appear to have been reported in the pages of the Farnhamian. “Before he attained his 19th birthday he held the rank of sergeant and in November was transferred to the Machine Gun Corps as, to use his own words, “There would not have been a chance of going out otherwise”. He went to France about a week after Easter of this year and was for a time at the base as an instructor in machine guns, but later went into the first line in charge of a gun and its team. Thomas Hollingsworth Tovey was the only son of the late Thomas William Tovey and of Kate Tovey, of 78 West Street, Farnham. Sergeant Thomas Hollingsworth Tovey was serving with the 2nd Company, Machine Gun Corps (Infantry), and was killed on 5 August 1917, aged 21. He is commemorated on Panel 56 of the Ypres (Menin Gate) Memorial, Belgium, and is commemorated on the School’s War Memorial. The death of Daniel Arthur Mardon does not appear to have been reported in the pages of the Farnhamian. “News has been received by Mr. & Mrs. A. G. Mardon that their only son Daniel Arthur Mardon has been wounded whilst on service in France. (As reported he later died of his wounds). “He is a second corporal in the Royal Engineers and for two years had seen service overseas. “He enlisted in September 1914 and was posted first overseas to Gallipoli and was present at the evacuation where they were transported to Egypt. For six months he served in Egypt and from there moved directly to France. On the sea journey to France his ship was torpedoed. He had served for twelve months in France before being wounded. “Daniel was born on 31st December 1894 and his parents Mr. Arthur George Mardon and Mrs. Ellen Louisa Mardon lived at 68 Castle Street, although Daniel was actually born in Hale. He initially attended West Street School before entering the Farnham Grammar School. “On leaving school he joined the Royal Engineers. 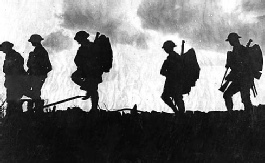 During the First World War they expanded their duties as greater technology became available. Among their general duties were laying and clearing mines, tunnelling under enemy trenches and maintenance of communications with their Signalling Companies. There were specialist teams for railway transport, inland waterway transport, bridge construction, and many other duties. Daniel Arthur Mardon was the son of Arthur George and Ellen Louisa Mardon of “Hawarden”, Farnham. Second Corporal Daniel Arthur Mardon was serving with the 11th Signal Company, Royal Engineers, and died on 20 August 1917, aged 22. He is buried in grave IV-F-19 in the Mendinghem Military Cemetery, Belgium, and is commemorated on the School’s War Memorial. The death of Walter Percy White does not appear to have been reported in the pages of the Farnhamian. “Walter Percy White was the son of Walter and Charlotte White of Ridgway Corner, Farnham. His father was born in Battersea, and his mother born in Bristol. He had a younger brother names Charles and according to a plaque in the Bourne Church he was a member of the church choir. Sergeant Walter Percy White was serving with the 2nd/21st Battalion, London Regiment (First Surrey Rifles), and died on 9 December 1917 [CWGC date of death], aged 27. He is buried in grave IV-F-19 in the Jerusalem War Cemetery, Israel/Palestine. His headstone includes the inscription: “KILLED IN ACTION SON OF WALTER AND CHARLOTTE WHITE OF FARNHAM, SURREY”. Walter Percy White is also commemorated on the School’s War Memorial. The death of Frederick Percy Cook appears to have been reported in the pages of the Farnhamian, albeit as F. R. Cook. “Frederick Percy Cook lived with his family at 8 Tavistock Villas, St George's Road, Farnham. He initially attended East Street School and then entered Farnham Grammar School by winning a scholarship. After a successful period at the school he joined Messrs. Ball & Co., drainage contractors, and was with them until he joined the army. He was a Wesleyan local preacher and hoped eventually to join the Wesleyan Church. He joined the 6th Battalion of the East Surrey Regiment, owing to not being able to get into the Queen’s Royal West Surrey Regiment, on November 14th 1914 and was for twelve months at their divisional headquarters. “When the Division was broken up he was transferred to the 7th Battalion and after training went to France. He was there for only five weeks before being wounded in action and was then reported as missing. His burial was reported as having taken place in an East German cemetery. “Frederick Cook and his brother Ernest Edward Cook joined up together and both were killed. Frederick Percy Cook was the sone of Mr. & Mrs. A. E. Cook of “Wey View”, Bridgefield, Farnham. Lance Corporal Frederick Percy Cook was serving with the 7th Battalion, East Surrey Regiment, and died on 13 December 1917, aged 22. He is buried in grave IV-F-19 in the Honnechy British Cemetery, Nord, France. His headstone includes the inscription: “REST IN THE LORD”. Frederick Percy Cook is also commemorated on the School’s War Memorial. The death of John Victor Twitchin does not appear to have been reported in the pages of the Farnhamian. John Victor Twitchin was the son of John K. And Catherine Twitchin, of Manor Farm, Holybourne, Alton. John Victor Twitchin was serving with the 2nd/5th Battalion, Hampshire Regiment, and died on 17 December 1917, aged 20. He is buried in grave D-269 at the Alexandria (Hadra) War Memorial Cemetery, Egypt. His headstone includes the inscription: “GREATER LOVE HATH NO MAN THAN THIS”. John Victor Twitchin is commemorated on the School’s War Memorial.